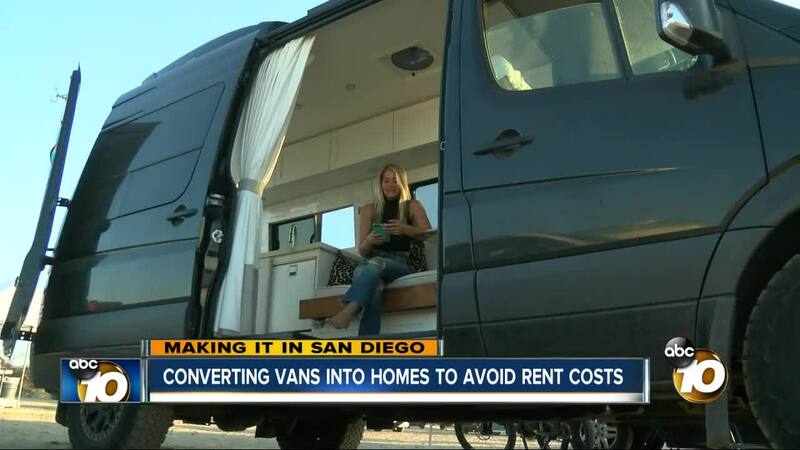 San Diegans are living in vans to avoid rent. SAN DIEGO (KGTV) - With picture-perfect views, San Diego appears to be a flawless place to live. However, with the average rent for an apartment around $2,000 and the cost to purchase a home around $600,000, America’s finest city loses some of its appeal. “Everybody said you’re set with your life,” Chris Allen explains. Allen is a former Navy rescue diver, swim coach, a husband, and a dog dad who fell on hard times because of a bad motorcycle accident. “I had like a 9 percent chance to live,” Allen said. This accident forced him out of work for six months, so he started living in his van. He ended up converting his van to include a fridge, a fold out bed, lighting and uses a bucket with kitty litter for the restroom. Now a year later, he’s embraced van life and says it provides a chance to travel and save money. “It’s more freedom, but at the same time it’s more responsibility,” Allen said. Allen isn’t alone. During a weekend meet-up, around 300 vans and van-lifers packed Fiesta Island to explore each other's vans, and discuss life on the road. Liz Bryant, who works as a social media influencer, is living in a converted Mercedes sprinter van. She said she started living in her van for the freedom. “We don’t want to be tied down to an apartment. We don’t want to be tied down to a monthly payment,” Bryant said. Sky Montrell is moving into her van because she is tired of throwing away $3,000 a month on rent. “The cost of living in LA is crazy,” Montrell said. Breanne Acio runs SD Camper Vans and converts vans for people looking for life on wheels. She says she’s seen an increase in customers recently. “A lot of people are downsizing, and they are putting their lives first and doing things they thought they could only do when they’re 65 and retired,” Acio said. The Van Life Movement has made a mark on social media. The hashtag "van life" has been used more than four million times. Even though the movement is growing in popularity, sleeping in your vehicle on city streets isn’t allowed. Those who do it, are willing to risk a ticket or have to move around from location to location. No vehicle may be parked continuously at one location on any public roadway for more than 72 hours. Parking is prohibited in alleys, except for the purpose of actively unloading goods or passengers, unless the alley is specifically designated as an alley parking zone. Parking of heavy-duty commercial vehicles is prohibited in residential areas unless the vehicle is loading or unloading goods or has a service call in the immediate vicinity. Parking unattached semi-trailers or auxiliary dollies on any street is prohibited except while loading/unloading (camping or utility trailers not included). Currently, there is a lawsuit filed against the city pushing for a lift on the ban against people living in their vehicles and parking on city streets for long hours. The city declined 10News' request for comment because the matter is ongoing.